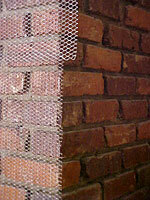 (919)742-3418 or email Bill through the website There are eight views of this project on this page. 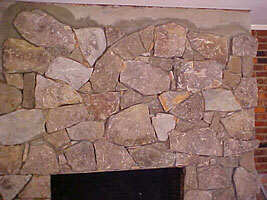 This job involves transforming a brick fireplace profile into a stone one. 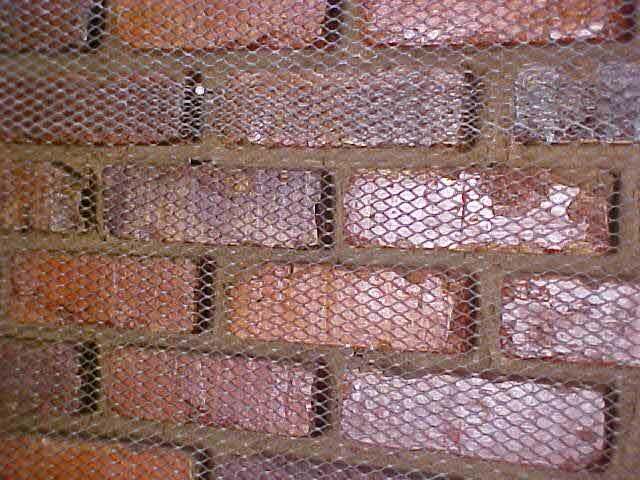 What you're looking at is the bricks, with the lathe attached to them using fluted masonry nails. The next step will be to stucco the lathe; then stone will be attached by the tile method. 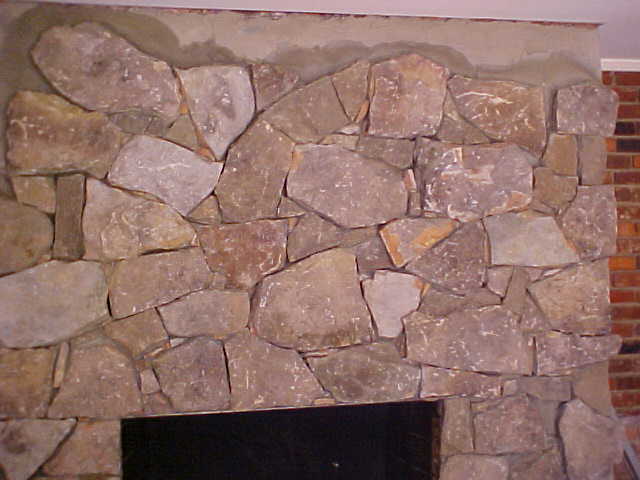 The stone will the stuck to the wall with the "faces" showing. 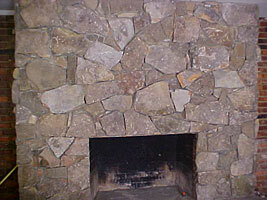 Another project (Burwell wall) used the same stone laid in a thick veneer with the edges showing. Click on any image on this page for a larger version. Use your browser's back button to return. 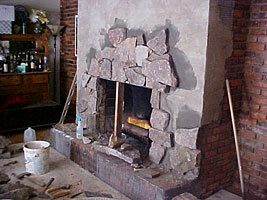 With the scratch coat of mud applied to the lathe on the front of the fireplace profile, the stone can start going up--more mud is applied to an area (it's a good idea to spray the dry mud coat with water as interior locations like this one are very dry), then a stone is back buttered and installed, and so on. 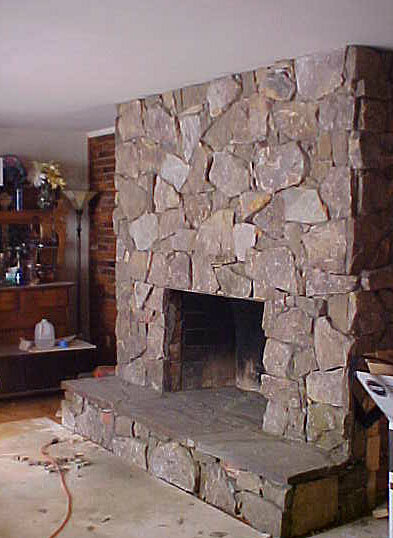 The flat steel that runs across the top of the fireplace opening isn't carrying weight, just providing a nice level stop for the stone to rest against. Click on the picture for a larger version. Use your browser's back button to return. 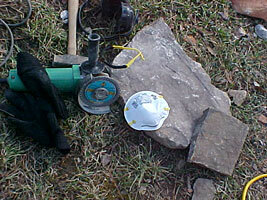 Sometimes a 4 1/2" grinder with a diamond blade is pretty handy. Note the safety stuff--eye protection, ear protection, and dust protection. The big rock will end up at the top left of the fireplace profile. 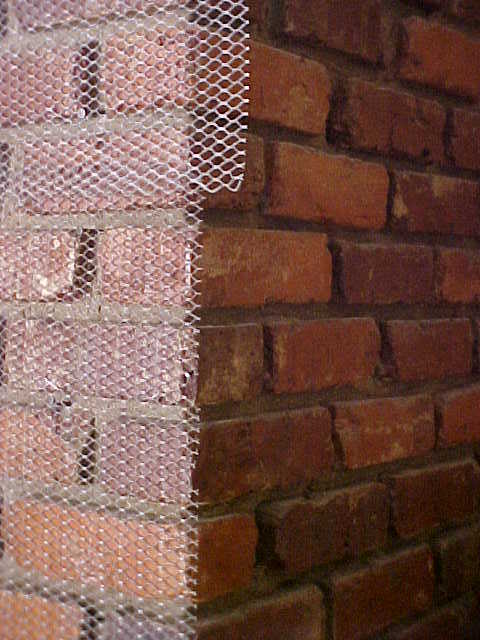 Click on the picture for a larger version. Use your browser's back button to return. 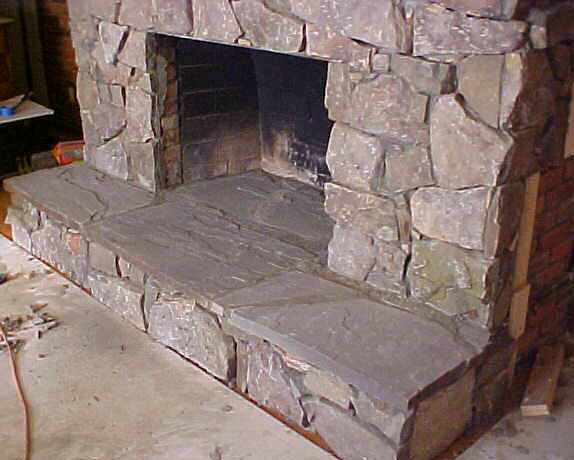 After all the vertical work is done, I went back to Scott Stone in Mebane, NC, and purchased some 2" thick large smooth pieces with right angle corners for the hearth. 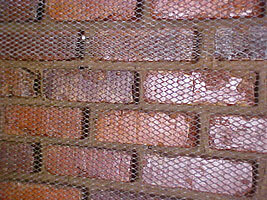 They were set last to avoid staining them with the mud that is going to drip off the vertical work from time to time. 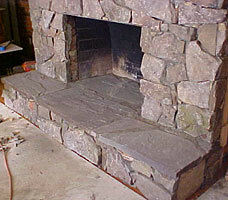 All that's left is for Jerry to install his new gas logs and enjoy the transformed fireplace. Click on the pictures for a larger version. Use your browser's back button to return.